Study, get good grades, excel on tests, and stand out in extracurricular activities to get into the right college. Once in college, do it all over again. For generations this has been the highway to success. Now with ballooning student debt and crushing unemployment, other paths beckon with greater allure. Blake Boles found his own path. This adventurer and entrepreneur runs Unschool Adventures, a travel company for self-directed teens. He maintains a community for self-directed learners called Zero Tuition College. And after years of helping young adults build productive and engaging lives he’s written the handbook Better Than College: How to Build a Successful Life Without a Four-Year Degree . It’s packed with concrete ways to achieve success without college. Unlike a blueprint, his method will be unique for each person, because it’s self-designed. Advance self-knowledge. Identify and continue to purse your driving interests. Give yourself assignments. Read, investigate, develop and follow-through on projects, do internships, start businesses, and in other ways increase your mastery. Create and share value. Build what others will find valuable and then share. This may include organizing groups, planning events, writing, coding, filming, and selling your work. Find support. Seek mentors and friends who will help you navigate your self-directed life. Share your goals with them and ask that they keep you accountable. Market yourself. Build an expansive portfolio, develop a strong network, and learn how to land jobs through creative means. Check out this thought experiment. The average family spends about $20,000 per year to put a young person through college. Blake asks, how could that money be used differently to achieve a higher education? 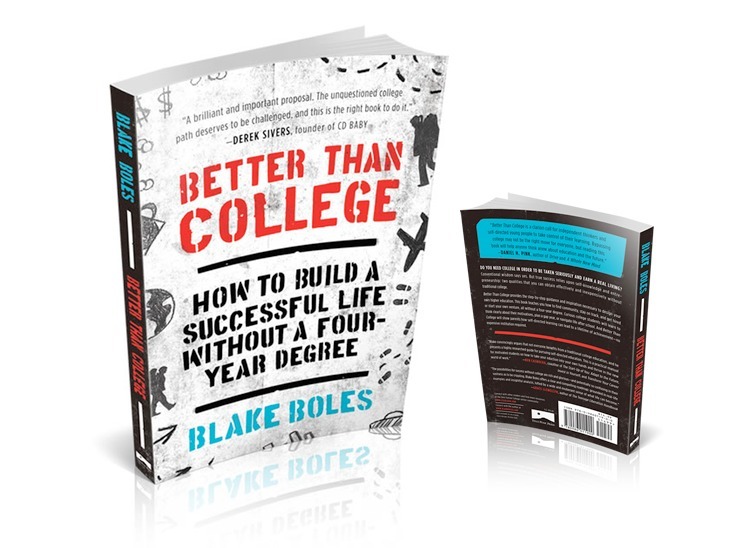 Find out more about the book at Better Than College. And to help you create success on your own terms, with or without college. check out nearly two dozen other tools. It may be the right time to consider a new path.